Stunning architectural form called Agora gave a new color in the City of Arts and Sciences, Valencia, Spain, a spectacular complex designed by Santiago Calatrava. This further adds to the list of interesting architecture that you can see when there on holiday. 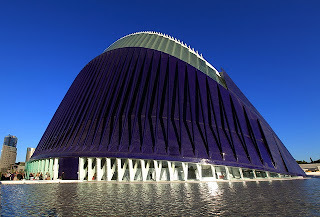 Still in the City of Arts and Sciences (City of Arts and Sciences), you will find the museum of science and the Palau de les Arts is an opera house and cultural center of Valencia. Not only current works are interesting to look at, you also can go to the cathedral museum is believed to be the location of the original holy grail (holy objects in the literature and the Christian tradition). After the tour, you can relax in the Garden Turia, a beautiful park that is often used as a gathering place for local residents. 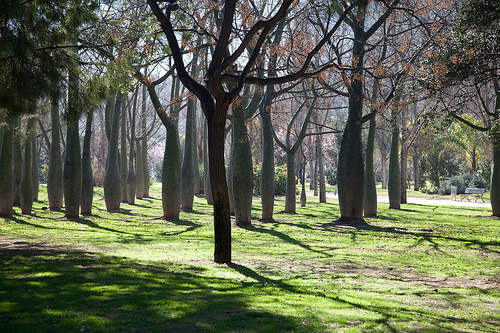 Walk the other way through the park, you'll find art museum and IVAM museum of contemporary art that has a Michelin star restaurant, La Sucursal. Of the contemporary art museum, you can continue the journey through the streets of the old town to the central market, where local production is sold in more than 1,000 stalls. For those who love the culinary, typical Spanish dishes (paella) can best be found in restaurants around the lake Albufera, six kilometers south of the city. For shopping or relaxing entertainment, visit Ruzafa district, around Calle Cadiz where you can find cafes, bars and funky shops. Oiya when it comes between March 15 to 19, do not miss the exciting Las Fallas festival. When in valencia, if you want a planned visit, you can follow the tour guide Valencia Guias (www.valenciaguias.com) with a guide fluent in English. If you prefer to explore by yourself, you can use MP3 audio guide which can be obtained from the tourist office (www.turisvalencia.com) in Plaza de la Reina 19. Another way is to use around Valencia by using Valencia Card (www.valenciatouristcard.com) for 8.4 Euro for a period of 24 hours. These cards offer limited access to public transport plus discounts at museums, attractions, shops and restaurants.